WASHINGTON (AP) — It seems likely that thousands more migrant children were split from their families than the Trump administration previously reported, in part because officials were stepping up family separations long before the border policy that prompted international outrage last spring, a government watchdog said Thursday. Most of the tens of thousands of children who come into government custody cross the border alone. But the report found that in late 2016, 0.3 percent of children turned over to Health and Human Services had crossed with a parent and were separated. By the summer of 2017, that percentage had grown to 3.6 percent, officials said. 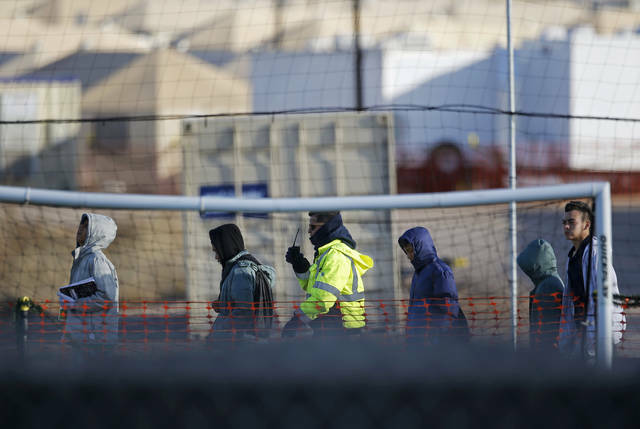 The watchdog did not have exact numbers, but the total number of migrant children who passed through the agency’s care during the 2017 budget year was 40,810. The separated children had already been released to sponsors, who are generally parents or other close relatives. Although the furloughs only affect federal employees, the collaborative nature of wild land firefighting means the pain of the four-week-long shutdown is having a ripple effect — from firefighters on the ground to federal contractors and top managers who control the firefighting strategy. A dozen senators from Oregon, California, New Mexico, Washington, Colorado, Nevada, West Virginia and Michigan sent a letter this week to Trump warning that the shutdown would put lives at risk this coming fire season. Classes necessary for fire incident managers, smoke jumpers and hotshot crews are in jeopardy in the near future, the senators said. Smoke jumpers parachute into remote forests to battle blazes not inaccessible by firefighters on the ground and hotshot crews are small groups of elite firefighters trained to battle the most ferocious flames. The first session of an apprenticeship program for wild land firefighters went ahead this week, Forest Service spokeswoman Katie O’Connor said. WASHINGTON (AP) — It took President Donald Trump one day to flex his executive power back at House Speaker Nancy Pelosi, denying her an aircraft for a planned trip abroad in apparent response to her attempt to delay his State of Union address amid their government shutdown clash. HAMILTON, Ohio (AP) — A man convicted of fatally shooting two women before shooting himself after a police standoff has been sentenced to life in prison without the possibility for parole. Authorities said James Geran (GEHR’-uhn) killed a woman they described as a business associate in a “criminal activity” and dumped her body in Madison Township hours before killing his girlfriend’s mother during a standoff with Butler County sheriff’s deputies in Trenton in June. He then shot himself. The 45-year-old Middletown man had pleaded guilty to a murder charge in the death of 27-year-old Maegan Motter and to an aggravated murder charge in the death of his girlfriend’s mother, 63-year-old Sharon McCleary. Geran released his girlfriend and her sister unharmed. Geran said in court that he constantly regrets his actions.